This 12”x12” canvas captures the fun of getting away from it all. 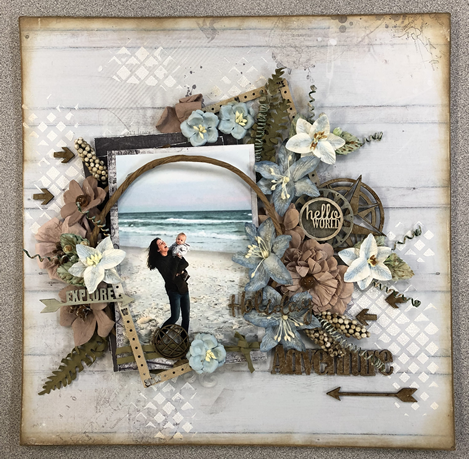 Enjoy creating this mixed media project using gesso, stencils, chipboard elements, flowers, and NUVO drops. Your canvas will be loaded with techniques, layers, chipboards, flowers, and more. Relive your memories every time you see a special photo from your favorite trip on display. Bring Basic Class Kit, Multi Medium Matte, foam paint brush, NUVO Drops: Dark Walnut, paper distressing tool, Distress Inks: Weathered Wood and Gathered Twigs, blending tool, glue gun & glue sticks, sanding tool, foam dots, & kraft knife.